Winnie-the-Pooh's best friend, Piglet, has fallen under the censorship axe in Qatar. Emir Hamad bin Khalifa al-Thani officially abolished press censorship in 1995, but the government is still blacking out imagery deemed offensive to Islam, such as Piglet, who portrays an animal the Muslim religion says is unclean. I thought it was because he was gay. 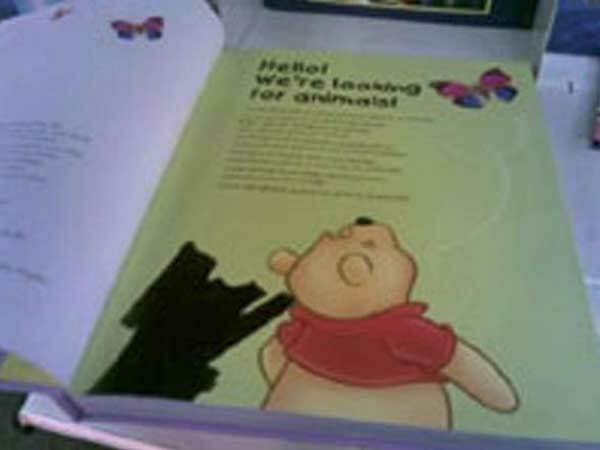 Of course, they'd also have to redact Piglet's name, which must make the story a bit confusing and, ironically, lead children to ask questions about why...and so drawing 10x the attention to, and sympathy for, the tiny, timid, "offensive" character than any child would have normally given it. I guess all I need to do to avoid the wrath of the Jewish, Christian and Moslem god is to sit in chariot of iron (i.e., car) with a jar of pig's knuckles on the front seat. Excuse my ignorance, if indeed it is, but are these not the same people whom stone women for doing what men do ? Pigs ? Pigs are intelligent creatures, and clean if kept in the right conditions. Keep a human trapped in your backyard for a year, with no flushing toilet and just some hay to sleep on, and see if he does any better than a pig. Dogs are unclean to them as well. That's a tragedy. Think of all the children who will never know the love of a puppy.